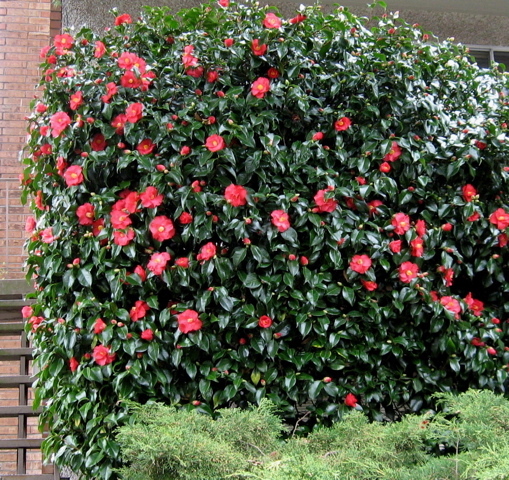 Two types of camellias grow well in the Seattle area: Camellia japonica and its smaller, daintier cousin, Camellia sasanqua. The larger of the two, C. japonica, is in blooming right now in Seattle and will continue into May. There are many varieties of this shrub, the Sunset Western Garden Book lists an entire page of them, but the most familiar form is the one shown below with deep, rose pink flowers. 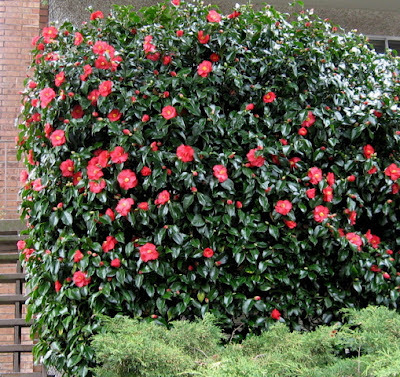 Camellias want some protection from hot sun, although you see plenty of them doing just fine in western exposures here in the mild summer climate of western Washington. Once established, they are quite drought tolerant. They do well in the acid soils of the Seattle area. 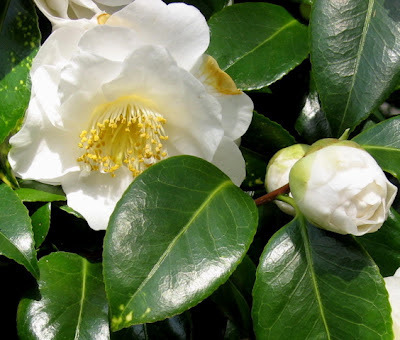 Fertilize with an acid plant food shortly after blooming to assist in setting healthy flower buds for the coming year. Prune these shrubs just after they bloom. Large specimens can be limbed up to make them into small trees. Note that flower buds for the coming year start to form within weeks of the last blooms. 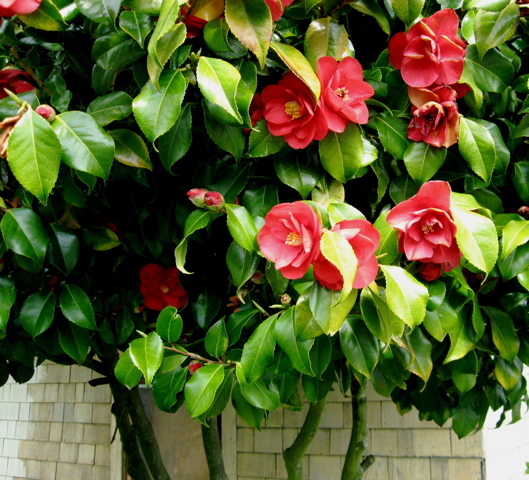 If you wait too long in the season to do your pruning, you risk losing next year's flowers. Camellia sasanqua is much smaller and finer textured than C. japonica. Many varieties have single flowers, as you see above, and bloom time is December through January. 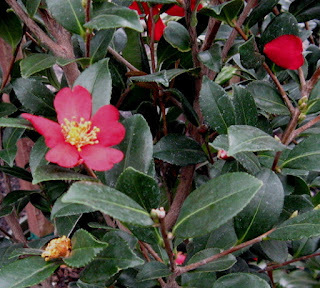 Sasanquas offer a greater variety of flower colors and variegations than C. japonica. Shop for them when they are in bloom to be sure of what you are getting. Sasanquas make excellent subjects for espallier.